It is a tech world where the devices and gadgets come hitting the globe all around with superfluous technology, updates and upgrades. It is very difficult to pinpoint which smartphone is really better and worth the purchase because there is a swift race happening between the high profile brands. Each of them is trying hard to bring their buyers closer to the heavenly feeling of technology with awesomeness of new features and new applications to use. Apple recently launched its iPhone 6 and iPhone 6 plus (on 9th September, 2014) which was the most awaited, nail-biting and talk of the town lately, it has already been in the rumors before the time and people were assuming by themselves what’s next Apple is coming with iPhone 6. There is no surprise in the fact that Apple has a big standard and it never does a thing on a lower gear. It keeps the confidence of people intact and people never feel regret buying Apple goodies. The new Apple iPhone 6 is commendable; it is an epitome of class and ultimate sophistication. This year the Apple watch has also set a new steppingstone and people are desperate about the purchase but it is not yet open for purchasing in the market. We can hope that it would for sure be better in its features. 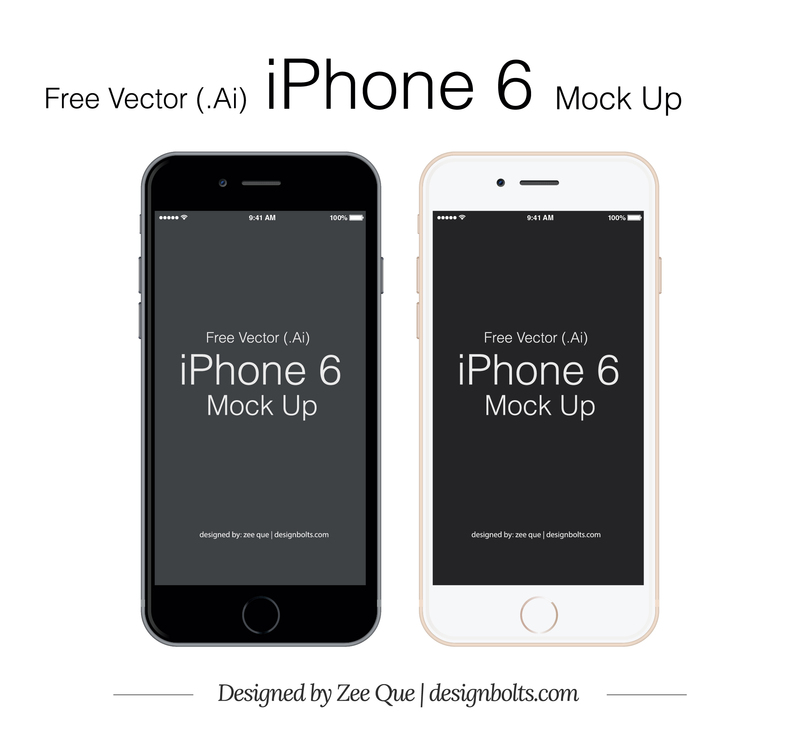 Today I am unfolding before you free Vector Apple iPhone 6 Mockup in Ai & EPS Format. You know presentation works like a magic, it builds an impression and makes the outlook more real and worth seeing. If I say, presentation adds to the beauty and stance of the thing it won’t be wrong. You can use this iPhone 6 Mockup for your personal projects. Keep keeping back for more such updates. We are here to cater the audience like you and your reciprocation with word of thanks always helps us growing and expanding the posts more and more. Have a look at it friends. I want to tell you : Thank you. that’s an amazing work that you did here. great finishings with those iphones. Why is the screen width 270px? I know it’s vector but isn’t iPhone 6 375 units wide?